QUIETPRO+ is a fully automated hearing preservation and communication system, which enhances soldiers hearing when needed and protects it against temporary and permanent damage. It has been designed specifically to protect the soldier against the full range of battlefield noise in the mounted and dismounted role. Exposure to high noise levels has long been recognised as an issue for infantry forces. The two types of noise; high steady (continuous) noise generated by vehicles or aircraft and high impulse noise generated by weapons or explosions are equally damaging in different ways. Soldiers who are exposed to these types of noise without adequate protection will suffer either temporary or permanent damage. Hearing damage is accumulative and irreversible. The quality of life and long-term health of service personnel is an important objective for military commanders and Governments, due to the growing number of cases of noise induced hearing loss on the battlefield. This condition results in costly compensation claims and is putting a real focus on choosing the best technology to counter this significant problem. The operational problems associated with exposure to noise include; increased levels of fatigue, lack of situation awareness and a breakdown in command and control due to the inability to send and receive intelligible radio communications. At all stages of tactical deployment a high level of communication clarity is vital. Intelligible communications at every level, up and down the command chain is the critical element in ensuring that messages and commands are received without error, misunderstanding or delay. Reducing the level of exposure to the constantly changing noise environment is the key challenge in providing protection and improving communications intelligibility. Across the operational deployment, in or out of mobility platforms, the soldier is subjected to different noise types and at different levels; both continuous and impulse noise. Today’s rapid deployment and re-deployment operations require soldiers to transition between mounted and dismounted roles efficiently and without user intervention and reconfiguration of the communications equipment. The ability to maintain uninterrupted communications, a good resolution of localised situation awareness (during and immediately after exiting the platform) and maintaining maximum hearing protection is vital. QUIETPRO+ is the only tactical communication ancillary system that provides automatic hearing protection throughout the full spectrum of deployed operations; from the moment the operator leaves the operating base to their return. Hearing protection is ensured while the user is inserted or extracted on a range of mobility platforms; AFVs, LAVs, Tactical Wheeled Vehicles, watercraft/riverine platforms and fixed/rotary wing aircraft. This protection continues during the platform dismount and during the dismounted deployment. The QUIETPRO+ uses digital Active Noise Reduction (ANR) that is effective at combating noise generated across the range of mobility platforms. The benefit of this technology can be fully appreciated when considering the maximum permissible exposure time for a soldier within a vehicle such as the M113. Using a headset that provides minimal passive protection, the maximum time that the soldier would be allowed to remain in the vehicle would be three hours. If it is considered that the typical performance of the digital ANR system alone provides an additional six decibels of attenuation, the soldier mounted within the M113 using the QUIETPRO+ would be able to remain in the vehicle for 12 hours. 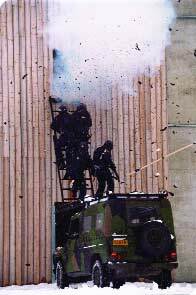 The protection continues when the solider dismounts through the use of both passive and active technologies. 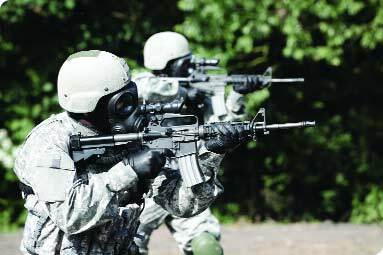 In many dismounted tactical scenarios there is a high level of steady (continuous) noise that can only be effectively combated using these electronic cancellation technologies. The adaptive nature of the QUIETPRO+ digital ANR, adjusts to the specific characteristic of the individual ear canal, ensuring that the digital ANR system remains highly stable (no squeals, pops or other unpleasant effects that are evident in poor performing ANR systems). Harmful high level impulse noises, present during training and operations are isolated from the user through the use of advanced digital signal processing. Rather than simply clamping or compressing the unwanted impulse noise to a pre-determined level, the QUIETPRO+ filters the harmful frequencies, instantly stopping them from reaching the users ears. Full natural hearing (situational awareness) is restored as soon as the harmful noise is no longer present. QUIETPRO+ employs an ‘in-the-ear’ headset; the lightweight and extremely ruggedized ear piece fits within the concha of the ear and does not obstruct the pinna (outer part). The pinna plays an important role in helping determine direction (localisation) of sounds in the user’s immediate surroundings. The stereo headset ensures that a high resolution of directionality is achieved. It will be of little surprise to learn that everybody’s ears are different, but it is not commonly known that ears differ left to right on the same person. Some are long and straight. Others have tightly bending canals that travel upwards. Some canals are round while others can appear square in sections. Quite simply, each ear is unique. Understanding this is a key component to the successful introduction of an in-ear communication and hearing protection system. To succeed in providing hearing protection and communications clarity, it is necessary to create an effective seal in the ear canal to prevent noise leakage. Research indicates that the ear canal’s shape and dimensions change significantly when the jaw is moved during speaking, eating and when the user is undertaking strenuous and physical activity. The practical application and results achieved through the use of in-ear devices can therefore differ enormously between sound laboratories and the battlefield. There are several approaches to solving this problem; including custom moulded ear plugs and expandable foam plugs. Each approach has its merits and drawbacks. Significant scientific research has been applied into developing foam and soft/hard silicone compounds to try and overcome these drawbacks. Ultimately, the selection and use of each type will be determined by the user’s personal preference and ability to fit the plugs into their uniquely shaped ear canals. However, a compromise on accepting inadequate protection should be guarded against. The QUIETPRO+ caters to the user’s personal preferences and enables different types of tips to be used with the ear piece. Since QUIETPRO+ entered operational service; more than 50,000 units have been fielded across 13 countries. More than 40,000 of these are in daily service with the US Army, US Marine Corps, US Air Force and US Government Agencies. The innovative and award winning QUIETPRO® system has under gone extensive testing and evaluation programmes by Government, military and independent scientific organizations. Following extensive comparative testing and evaluation, the US Army has chosen to add the Nacre QUIETPRO® to the Army’s Approved Product List for Program Management Office Clothing and Individual Equipment (PM C&IE) as the approved in-ear hearing protection device.